Long time WWR contributor Ross Hamilton, aka The Squire, has just posted his latest podcast - featuring yours truly prattling on about my 20 favourite bad records. The track listing (below) will be familiar to many, but it includes a couple of songs I've not featured here before. Fancy a listen? You can find it (and download it if you wish) right here . Many thanks Ross, it was great to finally meet you, share a pint and chat about our joint obsession. Happy Easter everybody. And what better way to celebrate the season than another round of creepy Christian ventriloquism? A couple of real oddities for you today courtesy of Bob Bradford and his daughter Debbie Ann, and the utterly nuts Geraldine and Ricky. First up are Geraldine and Ricky. 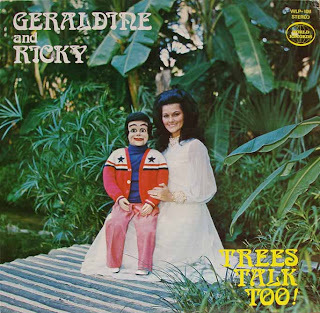 Hailing from Datona Beach, Florida, (although she later moved to Alabama to continue her ministry) Geraldine Ragan and her puppet Ricky have been active since the end of the 60s. Married to professional golfer Dave Ragan, Geraldine and Ricky have performed across the U.S and are (or were as recently as 2011) still surprisingly popular on Christian cruises. Geraldine believes her talent is a gift from God. Her future path was shaped when she attended a youth camp while she was still a teenager. “There was a ventriloquist there,” she told the Shelby County Reporter, “And I thought ‘If God can use a ventriloquist, he can use me.’” Geraldine immediately set out to learn her art. After high school she was offered a job at Disneyland, but declined in order to dedicate her life to full-time Christian service. I just don’t get the weird world of Christian ventriloquism. But then again I’ve always thought ventriloquism was a little creepy. I can see how it works in front of an audience, but on record or on the radio it’s just someone putting on a stupid voice. So why are there so many of them? The track presented here is from side one of her seminal album Trees Talk Too. Recorded in the studio in front of a small (presumably invited) audience, unfortunately the album is unbanded, so I’ve given you the first four minutes or so of side one: the Nickel and the Dollar/the Grand Canyon and A Million Dollars. If you want more get Googling; it’s out there. Geraldine and Ricky have issued a number of other recordings, including the High Cost of Being Lost (with E J Daniels) and a couple of live videos if you’re at all interested. The second track, and I have to thank the good folk at WFMU for bring this to the world’s attention, comes from the album Fun and Inspiration With… released around 1964/5 by ventriloquist and youth evangelist (as it says on the cover) Bob Bradford. Bob's act, which debuted around 1953, included his ‘friends’ Jiggers Johnson (who introduces the track), Leo the Lion, Alfred the Dragon, Snooky Snitzel and Whiskers the Wabbit. A decade later he decided to incorporate daughter Debbie Ann in his ministry, teaching her the art of ventriloquism and allowing the little moppet both air and studio time. On Joy Joy Joy Debbie Ann Bradford is joined by her own group of ‘friends’, namely Ann Slanders (clearly a play on Ann Landers, the pen-name used by various advice columnists from 1943 onwards) and Donny the Donkey. Although the track begins with Debbie and Ann limping their way through the classic children's inspirational tune, it starts to get downright weird once Donny the Donkey appears. Debbie’s own talents are limited to say the least, and her attempt at voicing both Ann and Donny are pretty stilted – the peculiar exchange which occurs between Debbie and Donny is clearly supposed to reduce the pre-teen audience to fits of laughter, but it’s about as funny as a punch in the face. Apparently Debbie is still working today, under her married name Debbie Gaccetta. Still, spare a thought for poor old Jesus as your tucking into you chocolate eggs this weekend: it’s him these crazies are working for! Welcome back, my friends, to the show that (seemingly) never ends. Apologies for being missing in action last week, but we were moving house and I was without internet access for a few days. Still, let’s get back to work. The oddity I present for you today does push the boundaries a little in as much as this is clearly a novelty record – albeit it a particularly bad one. I usually try to avoid novelties but as long time followers of The World’s Worst Records will know, sometimes they are simply unavoidable. This particular disc ‘celebrates’ the crimes of one Dennis Andrew Nilsen, serial killer and necrophiliac who is also known as the Muswell Hill Murderer. Nilsen murdered 15 young men in London between 1978 and 1983, retaining his victims' bodies before dissecting their remains and disposing of them via burning or flushing the remains down a lavatory. Convicted of six counts of murder and two of attempted murder in November 1983, he became known as the Muswell Hill Murderer as a number of his crimes were committed at his home at 23 Cranley Gardens in the Muswell Hill district of North London. The unnamed singer/lyricist of these tasteless tracks clearly hasn’t done his homework. He mentions living at 22 Melrose Avenue, Cricklewood, yet Nilsen began his crime spree at 195 Melrose Avenue. He was arrested after problems in the drains at 23 Cranley Gardens, Muswell Hill. Still, what do facts have to do with anything? Anyway, here are both sides of this rightfully-obscure 45. Enjoy! One of the most enjoyable aspects of compiling music for this blog has been discovering (or re-discovering) music, artists or companies that are now all-but forgotten. 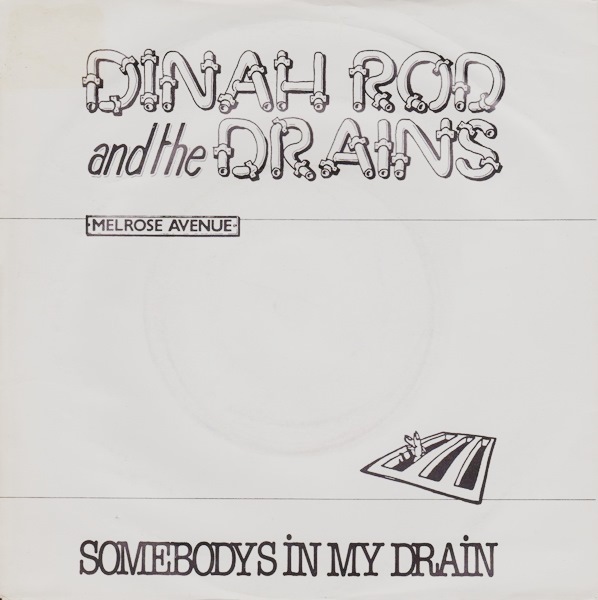 In the song-poem field this happens all the time: although the American Song-Poem Music Archive is exhaustive it hasn’t been updated for almost a decade, and collectors are constantly turning up new recordings. 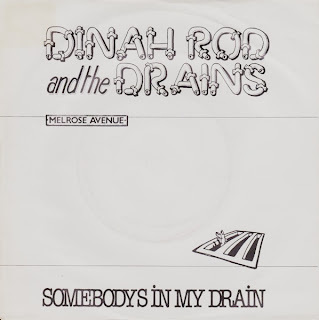 During the years I’ve been collecting song-poems I’ve ‘found’ at least four companies not listed there or on any other song-poem resource, including Circle-D (with at least two Rod Rogers/Rodd Keith releases), Globe imprints HFC and Kandee, and 50s New York outfit Vanity. I’ve also discovered UK companies who licensed song-poem material – Emerald (a Decca imprint) and Polydor offshoot Nashville. I’ve also been able to bring you almost-lost recordings by people such as the great Leona Anderson and the inestimable Mrs Miller, and lay claim to having rediscovered the genius of Grace Pauline Chew. But one thing I never thought I would turn up would be a previously undocumented release by one of the all-time giants of bad music: Marcy Tigner. You all know Marcy Tigner: she’s the Christian trombonist-turned vent act who releases a slew (anything up to 40) albums under the Marcy or Little Marcy tag. You know this. You also know that before she was encouraged to take up ventriloquism that she released a couple of instrumental albums under her own name. Yet I doubt if many of you knew that, between her brace of trombone albums and the first Marcy release, she released a bizarre, three-track EP under her own name using her own, odd, childlike voice rather than employing her later shtick of masquerading as a wooden dolly. Get Googling: pretty much all you’ll find are links to the eBay auction for the very EP I now own. None of the Marcy fan sites mention it: none of the weirdo music blogs I frequent seem to have featured it. A genuine rarity: the real missing link. Dating from the very early 1960s I guess. 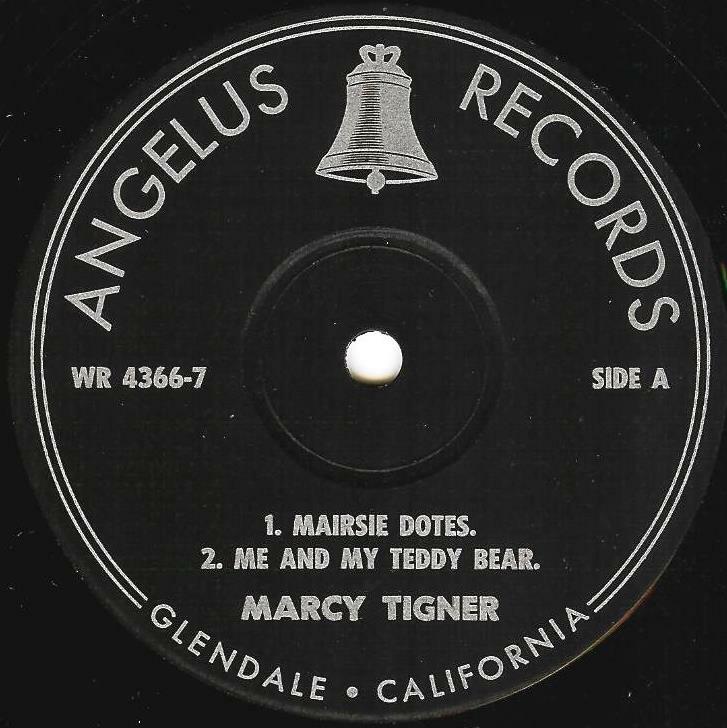 Here, in its entirety, are the three tracks from that EP: Marcy Tigner’s version of the standard Mairsie Dotes, plus Me and My Teddy Bear and Shake Me, I Rattle. None of the songs are credited: Mairsie Dotes is a novelty song composed in 1943 by Milton Drake, Al Hoffman and Jerry Livingston; Shake Me, I Rattle (written by Hal Hackady and Charles Naylor) has been recorded a number of times, including in 1958 by the Lennon Sisters and by Marion Worth in 1962. Me and My Teddy Bear (Winters-Cootes) has been recorded by dozens of artists – including those as disparate as Mitch Miller and Peter Gabriel. Today's slice of nonsense is a piece of ear shattering, head banging heavy metal from the rock god that is Billy Joel. Yes, you read that right: Billy Joel. For before Mr Joel began his career as a simpering, piano playing songsmith, before he married a model wrote an international smash about her and divorced her, before his attempted suicide by drinking furniture polish and before his box office-busting tours with Elton John, Billy Joel was a sub-Jon Lord-esque keyboard player in a heavy metal duo called Attila. 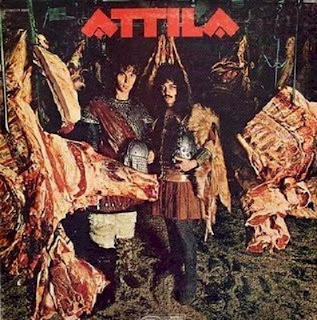 Formed from the ashes of his previous band the Hassles, Attila consisted of Joel on keyboards and vocals and drummer Jon Small. Small was Joel's best friend; it was he who rushed Joel to hospital after his attempted suicide and he who was repaid when Joel ran off with Small's wife. The pair seem to have patched things up though, and have collaborated on several projects since. Called ‘the worst album released in the history of rock & roll’ by critic Stephen Thomas Erlewine, why not have a listen to a couple of tracks of this preposterous drivel and decide for yourself? Here, for your delectation, is Attila with Wonder Woman and Rollin’ Home.